Over the past few years I have met a number of two-handed anglers that can boom big, beautiful Spey casts and look absolutely poetic doing it. They work hard, fish often and are occasionally rewarded with a tug and breath-taking chrome fish. Sadly, for many of these anglers their skills dwindle the moment their cast hits the water. Their arm drops to their side, the rod points downstream, a few may toss in a single mend but most just wait for the dangle and begin again. Thankfully for them, their sink tip and leader are a million miles away and hidden in the depths so they have absolutely no visual reference for how poor their swing actually is. Lucky for them, by the graces of God, current and tension, somewhere between mid-swing and the dangle, the nasty belly that developed in their swing will unfurl naturally and present a fly a fish is willing to eat. Whether you are a new or a seasoned two-handed angler who fishes down and across stream for steelhead, a lot can be learned by swinging flies to rising trout during a hatch. When you swing a classic wet fly pattern to rising trout you will become suddenly aware of problems you never knew you had when dredging for steelhead deep in the buckets. Just know, whatever problem you see when fishing in the upper deck of the water column for trout are magnified 10X with a sink tip in the lower water column. If you want to raise the bar on your streamer game for steelhead, take time this summer to fish a single-hand rod down and across to trout. You won’t regret the discoveries you’ll make along the way. MENDING: When you begin mending fly line to create a proper presentation for trout rising to insects, you will suddenly realize the disadvantages of fishing shooting heads with running line that is nearly impossible to mend. Knowing these disadvantages will change how and where you boom Spey casts to eliminate problems you never knew you had before. LEADERS: When wet fly fishing for trout you will learn the importance of a leader straightening before it hits the water. A winged-wet fly “won’t fish” on a piled leader. The fly won’t sit upright. It won’t wiggle and it won’t catch trout. Piled leaders are fuel for a nasty belly in the line. You may even gain an appreciation for wider loops. CURRENT VELOCITY: When fishing the upper water column, even in seemingly soft “jiggley” water, you’ll find your fly skating erratically through the film or whipping downstream when you least expect it. You will gain a new appreciation for the angles you swing – especially when you consider a deep swung fly also wrestles with vertical velocity. ROD USE: When you begin to manipulate fly line in a way that can consistently take trout on the swing you will realize the rod is as much as a tool for line manipulation as it is for casting. If you simply let the rod hang at your side and follow line as it moves, it’s not working as hard as it could. TENSION: The graduate school of the swing is tension. When you apply tension, how hard or gently it is applied determines how the fly moves when you want to move it. Whether you are making a winged wet fly rise to the surface like a hatching insect or stalling a streamer in the bucket to get a few more pulses out of your intruder, tension is the art of the swing. If you don’t have your leader, velocities and mending under control, you can‘t even play in the tension sandbox. 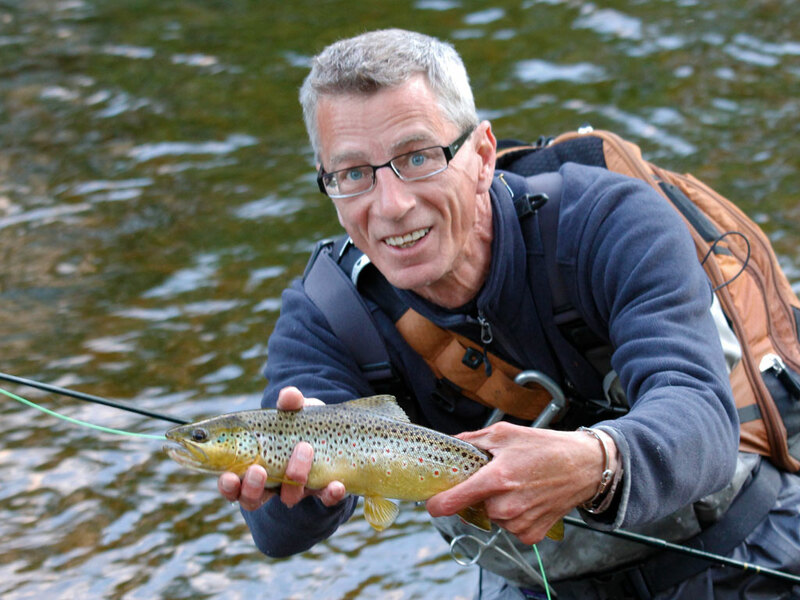 Down and across angling for trout is rich in history and classic fly fishing literature. While new technology has brought a new focus on the down and across presentation, it has been around for centuries. Great anglers of bygone days have faced the same problems you do and likely solved and written about them in depth. Take time to read the classics, fish classic flies and celebrate the roots of the swing. Let the trout be your teacher. By next season you won’t even recognize the angler you once were.